You’re a responsible homeowner so are always looking for a way to save energy and utility costs. Some sources claim you can save up to 16% annually on your hot water bill by insulating your water heater. Is there anything to that? 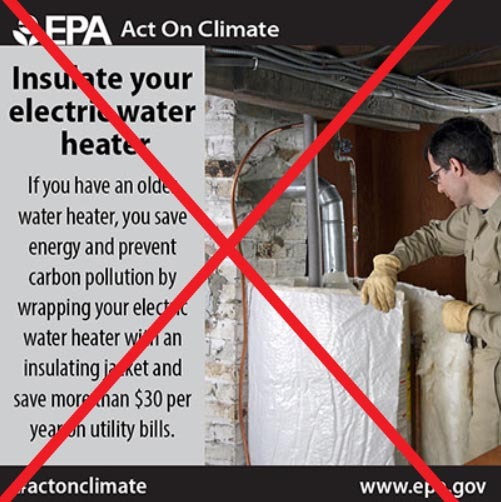 Unlikely, and I’ll tell you why adding an insulating jacket to your water heater is a bad idea. Electric heater insulation wraps can block air flow for a gas heater and cause a fire. It’s happened far more often than you would think. Wiring can overheat on any water heater if it was not designed for the additional layer of insulation. Your warranty will be void if you wrap it. This is the case with pretty much all manufacturers today. Since around 2000 they have been designing their tanks to be well insulated, and adding anything else on the outside will at best do no good. It could do a lot of harm. So if your water heater is newer than 17 years old, which virtually everyone’s is, hum that old Beatle’s song in your mind and just Let It Be. Older PostHow often should I change my furnace filter?